We are synthesizing a standard library of BabbleBricks that will function as information storage units. BabbleBricks are modular DNA fragments that are designed for assembly into larger constructs. Below is the sequence organization of our BabbleBricks. Word: The actual word sequence in each BabbleBrick is only 7bp long. This can be more accurately be referred to as an 'information coding' region as the meaning or word assigned to each BabbleBrick is completely arbitrary. We have chosen to encode Ogden's Basic English to our BabbleBricks as a proof of concept, however, the computer programme we have developed for assigning meaning to each BabbleBricks allows you to customize this. You could just easily encode a Chinese lexicon or numerical values. The 'N' bases in the picture above indicate that any DNA base pair (ATCG) can be there; different combinations correspond to different words. Stop Region: We plan to store BabbleBricks cell-free; instead they will be stored as part of a larger DNA construct, a plasmid. Since not stored in an organism, the information is less susceptible to mutation. 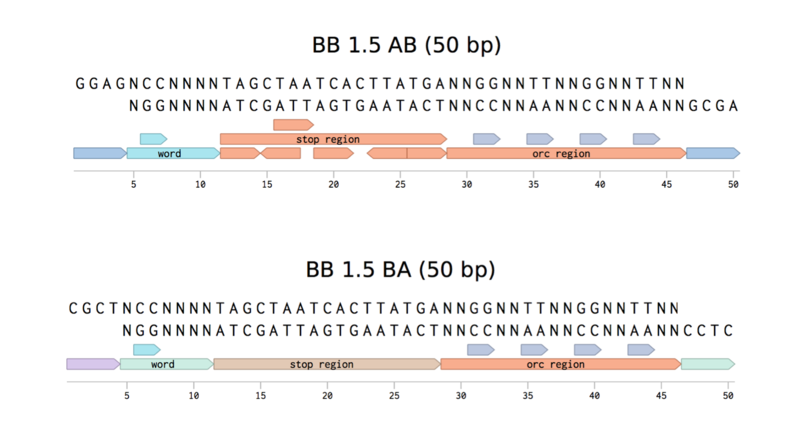 To make extra sure that our BabbleBricks are safe, we have included a 17bp STOP codon region in every sequence. This means that if a BabbleBrick DNA sequence were to find it's way into an organism, it would be unable to code for or create any proteins. ORC: We are using optimal rectangular codes as error checking devices. During decoding, our programmes will check each ORC for errors. Each ORC is unique to each 5bp word sequence; if an ORC does not match the word it belongs to due to a point mutation, we will be able to not only detect, but also correct the error. Hangs: Each BabbleBrick exists in two forms- an AB form and a BA form. This refers to the combinations of 'sticky ends' or overhangs the fragment has. We have designed our BabbleBricks this way so that during assembly, an A overhang can only attach to another A overhang, and a B overhang is only compatible with another B overhand. This ensures that only one BabbleBrick is annealed to the larger construct at each step of assembly.